Two eco-documentaries have been nominated in this year’s Academy Awards. Director Josh Fox’s documentary ‘Gasland‘ has been nominated for Best Documentary. The Warriors of Qiugang, co-produced by Yale Environment 360 with filmmakers Ruby Yang and Thomas Lennon, has been nominated for Best Documentary (Short Subject). 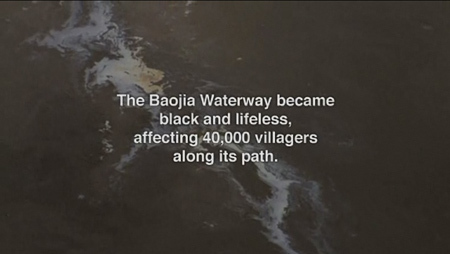 The Warriors of Qiugang follows the story of the Chinese village of Qiugang and its fight against a polluting chemical factory. The factory had little to no pollution controls, which is quite often the case. It churned out chemicals, pesticides, and dyes, turning the local river black, killing fish and wildlife, and filling the air with toxic fumes that burned eyes and throats and made children sick. The documentary “tells the story of how the villagers fought to transform their environment, and, in the process, found themselves transformed as well”. The film focuses on farmer Zhang Gongli, nearly 60 years of age, who leads the village’s struggle to shut down the chemical plant. The above image is from The Warriors of Quigang video. Watch the 39 minute video here. Gasland has already won the Special Jury Prize for Best US Documentary Feature at the Sundance Film Festival in 2010. The documentary follows the filmmaker Josh Fox as he travels around meeting rural residents on the front lines of ‘fracking’, or hydraulic fracturing. It’s a technology developed by none other than Halliburton. You may remember their involvement in such environmental whoopsie daisies as the Gulf Oil Spill. Fracking is a means of extracting gas from deep in the ground. A well is drilled and millions of gallons of water, sand and chemicals are injected under high pressure into the well. The pressure fractures the rock and opens fissures that enable natural gas to flow more freely. The filmmaker travels across 32 states to meet other rural residents (besides himself) on the front lines of fracking. The embedded Gasland video trailer shows a taste of what he finds. Both films contain pretty hard hitting stuff. May I suggest seeing a romantic comedy as your next choice after watching these, if you haven’t seen them already? If you have seen them, what did you think?